During the winter months, the air in the house can get pretty darn dry. And when I say dry, I mean really dry. Like BBQ in August at Beggar’s Canyon on Tatooine DRY. More of Aunt Baru’s ribs anyone? With a toddler (and a baby on the way) it is important to keep the humidity level in the house up. Not only for comfort, but also for health reasons. So, how do we keep the humidity levels up while keeping the decor of the house at an acceptable level of ‘Geekdom’? Who can keep the baby’s room humid while simultaneously intimidating Japan’s capital? Only this cute little guy! 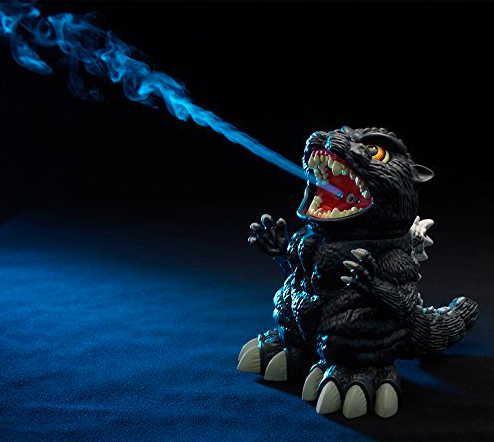 Complete with LED lights that act as ‘The King of Monster’s’ radiant heat rays, this Godzilla Humidifier doesn’t hold anything back. When you Turn on the Power Button, Godzilla’s theme music will star, just like when Godzilla appears in his movies. Who doesn’t love Gru’s wonderfully cute little helpers? The LED eyes on these cute Minions light up to let your little one that they are always being watched over. Kinda like a cuter and less creepy ‘Elf on a Shelf’. This is the actual unit we have in Lil’ G-Man’s room. We selected the R2D2 humidifier not only for its ascetic value (which makes it worth the purchase alone) but also because its 1 gallon water capacity means we are not constantly needing to refill it. At only $29.99 (and Amazon Prime eligible), how can you go wrong? Room humidifiers aren’t just for little boys! Enter the Hello Kitty room humidifier! This unit is similar in size to the R2D2 unit we have and has a removable half gallon tank that fits under a bathroom sink for easy refilling. The Hello Kitty unit also uses the same anti-microbial technology as our unit. This humidifier is also an LED projection lamp that shines the moon and stars on your child’s walls and ceiling. This portable diffuser also features multiple spray settings and light colors! Next Is The New UFC Comic Book Simply The New NFL SuperPro? I need Godzilla for my work desk! What an awesome find!